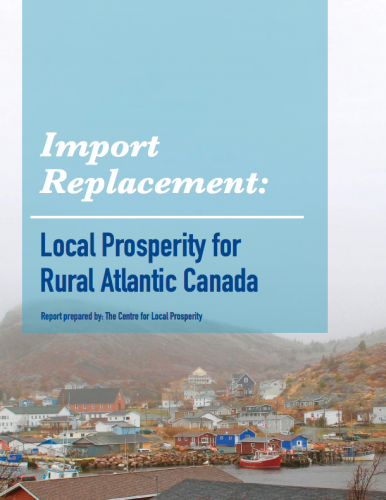 The Centre for Local Prosperity has released a report on an Atlantic Canada regional project studying the economics benefits of import replacement as an economic development strategy for communities within the region. Import replacement is an economic tool designed to complement exporting, to provide a more balanced and integrated approach to local economic development and sustainability. A community (or region) focused on import replacement would seek to produce goods and services that are currently imported in order to keep money circulating in the region. By developing local production, it would increase its capacity to meet the economic, social, and cultural needs of the people of the region from within the region, not in a spirit of isolationism but in a spirit of self-determination. Import replacement is not a substitution for exports, but a way of decreasing a region or community’s vulnerability to external pressures—a story the Atlantic Provinces know too well. Homegrown industries diversify and expand the local economy and they naturally begin to look toward regional, national, and global markets as they expand and grow. While the export model has dominated politics, public policy, and economic development discourse, this alternative complementary model has slowly been gaining recognition as ‘the other side of the coin’ – this complementary model is import replacement. The study conducted in-depth analysis of four communities in the Atlantic Region – Shelburne, NS; Miramichi, NB; Souris, PE and Burin Peninsula, NL. Initial outcomes were presented at the Nov 3-6, 2016 Local Prosperity Miramichi conference. Prosperity through Self-Reliance: The Economic Value of Import Replacement in Atlantic Canada & How to Achieve It (PDF). Leakage analysis using IMPLAN database. Bridging Import Replacement Theory and Practice: A Sociological Examination of the Potential for Import Replacement in Atlantic Canada (PDF). Data from eight focus groups in four case study communities.